I remember this one from when I was a kid, but with that WTF cover, who wouldn't? The title's a little bemusing for anyone who doesn't get too far in the book, as you start with the intention of tracking down the floating sphere that destroyed your village and parents (at least this time, a rarity in FF, it's personal). But in this lengthy adventure - the book only looks thinner 'cause the font, though cool, seems to have shrunk 20% since the last book - it's soon apparent the sphere is merely a practise run for what is obviously a more efficient and aerodynamic flying device, a tower. There are a few added elements which make Tower of Destruction pretty cool - a time score, and an honour score. They're both pretty self-explanatory, and work well together, pushing and pulling you away and towards helping out your fellow sphere victims and onward to your goal(s). So, I start by doing my best Jack Shephard to help a few victims, before heading north in pursuit of the sphere. Helpfully, it's done its best Mr Plow and melted a whole lot of snow, making the journey relatively easy. Soon enough I'm forced to divert, so choosing between the path with nothing and the path with living, breathing, and talking owls, I go that way. The owl tells me to see Tasrin the Sage, so I decide a day off the broken, beaten and scarred path is worth it to see a guy who's mates with a talking owl. I soon arrive at his place, avenge his death by killing the demon that killed him, and ransack his house for useful things as he tells me his dying words - find the Ice Palace, yada yada yada. The instructions kind of made it obvious I'd need to find this Ice Palace, so thanks for a day wasted, Tasrin. Three days into my pursuit, it's time to move on. 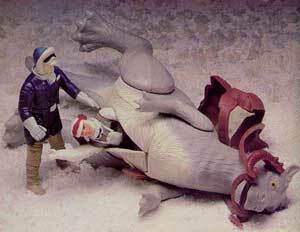 Being snowy everywhere, I make camp one night Luke Skywalker-style in a dead snow fox, taking its carcass with me in the morning. I'm only able to carry a maximum of 10 provisions, but an entire snow fox is okay? I assume I'm wearing it Freddy Got Fingered-style. Day four, and ToD is one of them gamebooks where you're forced to eat meals without any noticeable benefit. In fact, apart from trudging through snow, you spend more time eating than anything else bar fighting demons of different varieties. I spend the next night in a cave, wake up in the morning, eat, leave and notice a dragon floating about - just my luck, I spent the night in a dragon's cave. Hmmm. He flies down and asks me if there is any reason he shouldn't have 'iced human' for tea. Flattery fails to calm him down, and oddly enough for someone that wants 'iced' human, he flames me - then again, I don't know of any dragons who breathe ice (damn, I was hoping to get to the end of this entry without using the word 'ice' - something the author seemed unable to do with each paragraph). After dispatching the dragon, I soon came across a destroyed barbarian camp, where the text informed me it was obvious the sphere had lowered itself to wreak more havoc, as the trail of burnination had widened - odd, cause in my understanding of physics and burnination, if you come closer to something, the beam should be narrowed. Anyway... day six, and I've reached the sphere. I'm not sure how, but post-the barbarian camp, I no longer question the rules of science in this part of Allansia. It's small, only 12 metres across,and I find the entrance, wander in and there are passages, doors, stairs, more demons, etc etc. Turns out it's some kind of evil Tardis! Wandering through it, I eventually come its core where there's a wizard, a demon statue and a warrior orc. The wizard starts flinging magic darts as I battle the ogre, but I quickly notice that every time the wizard magics some darts, one of the statue's eye gems glows. Sacrificing a part of my body to the orc so I can ignore him and dislodge the gem, the gamble pays off when the wizard disappears. After killing the orc, I quickly scull back some brandy and a potion of stamina, hoping they mix well, and pick up the orc's sword. It's magic, but only if my skill is below 12, which mine already is. WTF? You mean I'm just as good at fighting with a normal sword as I am with a magic one? Weird, considering the enemies in this book aren't exactly a walkthrough, and any provisions you have are gobbled up with mandatory meals for the overweight snowman you play. Anyway, onto driving this thing - it's impossible, electrocuting me as I try to, but a rumbling warns me something bad is about to happen, so I bail. There's someone crying out for help, but screw it - this thing's weird enough as it is. I escape easily, and it explodes. 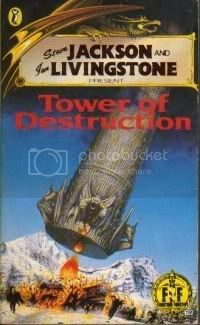 The book's called Tower of Destruction though, so it's no surprise when the wizard reappears in hologram form to tell me the sphere was just a practise run - cause running a flying sphere of doom is just the same as a tower, uh huh. So. The talking owl then turns up and berates me for leaving the dying man behind. There wasn't an option to argue with the owl, but I would have said something along the lines of, 'You're a talking owl who can see and know things he shouldn't be able to - YOU find the freakin' tower! YOU save the man! AArhgrahharARgh. And can I please have some food, I seem to have an eating disorder." Walking on, drinking brandy in place of food (so close to my student days, perhaps without brandy, but with Pushkin), I dig through the no-longer plowed snow, and crash in another cave, like I didn't learn my lesson last time. Another night or two, and three or four feeds later, I'm at the Ice Palace. Thinking what the hell and walking up to the front door, it turns out it's not even real, and I'm soon encased in a volley of ice spears - so cold, they kill me. Can't say I remember this part at all, but no matter. Tower of Destruction seems like a good read, it's focused and atmospheric, though I'm not sure whether that's the snowy, South Park-esque setting or the new, shrunken font. The story, being a trek in pursuit of a target which is carving out the primary path is quite linear, at least as far as I got. I read somewhere the 'true path' contains a massive 180 paragraphs, which would explain why I played for my normal length of time and only completed the apparent first third of the adventure - the sphere. There's an entire Ice Palace section and then the titular tower itself I never even made it to! Well written though, and pretty solid. The artwork's pretty good too, if a little on the 'here's your enemy looking tough in a front-on portrait' heavy. Happy new years. Catch you in '09! PS: Make sure you have a Skill of at least 11. Ah, this is where Keith Martin started to make his games puzzle-heavy. Although you haven't reached the part where the puzzles get heavy (most of them take place in the Ice Palace). Still one heck of a writer, though. The implementation of the Time rule is rather pointless, though. It only lasts for less than 1/3 of the book, and you can only avoid some of the tough monsters if you make it to the Sphere in about 4 days. But as far as I remember, to do that you'll have to miss quite a few of goodies in the process, like the one you'll pick up in the dead wizard's house as well the the important Honour point you pick up in the Barbarian's sidequest, and some of the helpful merchandise you can buy from the camp. The only real way of "wasting your time" is if you choose to wait for the Ice Dragon to leave (he never does). There's something helpful to be gained in all the little sidetracks. All in all, missing all that just to reach the Sphere quickly wasn't really worth it. Did you by any chance figure out the clock puzzle in the ice palace at paragraph 14? I know that the solution is 80, but i haven't found out how to get to that number. Yes, this one had a lot of puzzles. I eventually figured out the organ cipher, but the clock puzzle had me stumped too. I recall it being optional (the organ cipher technically was too, but you didn't really stand a chance barring freakish dice rolls if you didn't solve it). One of my favourites actually, though it was fight-heavy. Here's some help with the clock puzzle. I'm always crap at explaining these things, so I'll try to make this quick. Basically you multiply the number the hand is pointing to by the number of arrows on the hand. The twist is this: if the length of the hand is short, the clockface is a regular 12 hour clock. If it's long, the clock face as a 24 hour clock. The actual sequence emerges once you've done the multiplying. Just read your explanation rick and finally that thing makes sense! I found ToD in a box of old stuff I was throwing out and kept it to had a flick through. I remember being completly unable to solve that puzzle when I was young, still couldn't do it in my late 20s! I think Keith Martin might have overstepped the mark with puzzle difficulty there! I just got this one off Amazon Marketplace and played it through- I really enjoyed it. Very atmospheric and good gameplay. I remember liking the Ice Palace sequences as a kid, with the sense of a mix of traps and automated guardians who would attack unthinkingly and some ghosts that retained enough of their sense of self to be able to help you. I agree that some of the puzzles are ridiculous, but the clock one (which I didn't even find on my run through) and the musical notation one are optional and, contrary to what Andrew said, I don't think the music puzzle requires ridiculous dice rolls if you miss it- you miss out on being healed (but there are plenty of bottles of brandy, potions of stamina, provisions and Elvish weybread lying around) and on getting the Potion of Invisibility (which then requires a successful Test of Luck or similar)- so it's worth solving, but not essential by any means. The one that struck me as unfair was the puzzle to get the Ice Bird from the cathedral. This one required a knowledge of prime numbers, which I managed well enough but a kid who's in FF's target demographic may have had a bit of trouble! And if you don't get it, you miss out on the crypts and the Ice Sword, without which you'll probably get squished by the Big Bad and you'll definitely get zapped at the end (after destroying the Tower, but still). I suppose we should be glad that Keith Martin was promoting mathematical literacy! Not sure if people are still checking here but I may as well ask. I can't work out the 0 1 10 35 84 205 sequence. I know the answer is 374 but not why.